Fisssh. 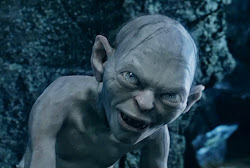 The Short Blogger tells us that on Fridays during "Lent," it doesn't eat orcses or other meats. So it may eat fish instead. We thought this was a nice idea. One day, one whole day just for fishes! Smeagol liked this. Then it offers to take Smeagol to a "fish fry" last night. It tells us that they have lots of fishes for Smeagol, all the fish Smeagol could want. What is the fry, we asks? But it doesn't tell us. It tells us to come along and see. A fish fry, oh no precious. Not again, not ever! It cooks the fish! It fries it! Ruins the juicy, tender fishes! It puts it on fire, burns it, adds nasty bread, thinks it tastes good. No, precious, no it does not! We wants our fish raw, yes, raw and wriggling! Smeagol hates fish. Nasty fried fish! Precious is very disappointed. We dursn't do this again.